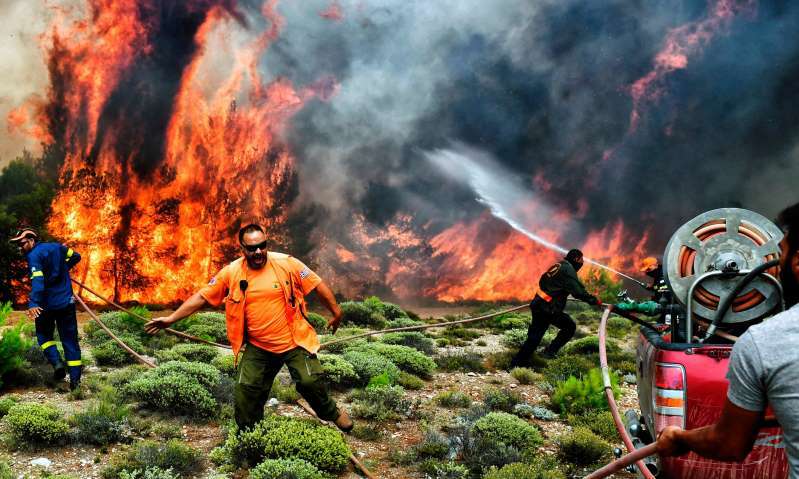 © AFP/Getty Images Firefighters and volunteers tackle the wildfire at the village of Kineta, near Athens on 24 July. Fury over the Greek government’s handling of forest fires that saw scores of people burn to death barely 15 miles from Athens has escalated. The leftist-led government has been left reeling from the disaster.In what has become one of the worst natural disasters in living memory, many victims were children and rescue crews are still combing the land and sea for missing people. On Friday assumed political responsibility for the tragedy but stopped short of satisfying calls for the resignation of Nikos Toskas, the civil protection minister and other officials. Addressing his cabinet he repeated Toskas’s assertion that evidence seemed to point to arson. But on Saturday the fire service’s arson crime unit rejected that theory, claiming it had very likely been sparked by someone burning wood in the area of Daou Penteli, where the wildfire is now known to have started. The Greek daily Kathimerini said the culprit’s identity was already known. As the fallout intensified, two deputy mayors in Marathon, the area worst hit by the fires, resigned, saying their conscience did not allow them to remain in their posts. Echoing Varoufakis’s argument that austerity inflicted on Greece had also played a role in the inability of authorities to respond effectively to the disaster, Stathopoulos admitted that budget cuts had rendered at least 30% of the service’s fire engines useless. The debt-stricken country has applied the tough measures in return for bailout loans to keep bankruptcy at bay.